An international team of researchers led by the University of Cambridge found that the addition of potassium iodide 'healed' the defects and immobilised ion movement, which to date have limited the efficiency of cheap perovskite solar cells. These next-generation solar cells could be used as an efficiency-boosting layer on top of existing silicon-based solar cells, or be made into stand-alone solar cells or coloured LEDs. The results are reported in the journal Nature. Despite the potential of perovskites, some limitations have hampered their efficiency and consistency. 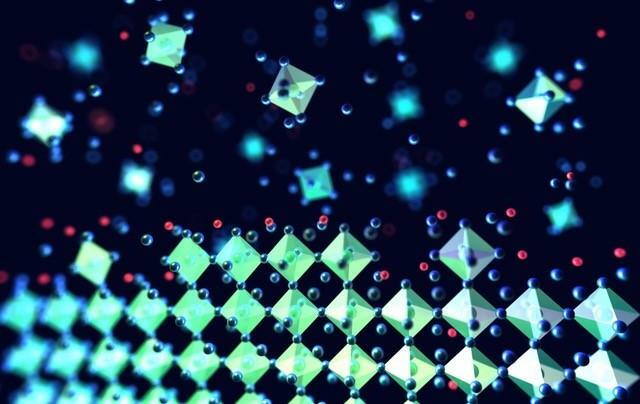 Tiny defects in the crystalline structure of perovskites, called traps, can cause electrons to get 'stuck' before their energy can be harnessed. The easier that electrons can move around in a solar cell material, the more efficient that material will be at converting photons, particles of light, into electricity. Another issue is that ions can move around in the solar cell when illuminated, which can cause a change in the bandgap – the colour of light the material absorbs. "So far, we haven't been able to make these materials stable with the bandgap we need, so we've been trying to immobilise the ion movement by tweaking the chemical composition of the perovskite layers," said Dr Sam Stranks from Cambridge's Cavendish Laboratory, who led the research. "This would enable perovskites to be used as versatile solar cells or as coloured LEDs, which are essentially solar cells run in reverse." In the study, the researchers altered the chemical composition of the perovskite layers by adding potassium iodide to perovskite inks, which then self-assemble into thin films. The technique is compatible with roll-to-roll processes, which means it is scalable and inexpensive. The potassium iodide formed a 'decorative' layer on top of the perovskite which had the effect of 'healing' the traps so that the electrons could move more freely, as well as immobilising the ion movement, which makes the material more stable at the desired bandgap. "Potassium stabilises the perovskite bandgaps we want for tandem solar cells and makes them more luminescent, which means more efficient solar cells," said Stranks, whose research is funded by the European Union and the European Research Council's Horizon 2020 Programme. "It almost entirely manages the ions and defects in perovskites." "We've found that perovskites are very tolerant to additives – you can add new components and they'll perform better," said first author Mojtaba Abdi-Jalebi, a PhD candidate at the Cavendish Laboratory who is funded by Nava Technology Limited. "Unlike other photovoltaic technologies, we don't need to add an additional layer to improve performance, the additive is simply mixed in with the perovskite ink." The perovskite and potassium devices showed good stability in tests, and were 21.5% efficient at converting light into electricity, which is similar to the best perovskite-based solar cells and not far below the practical efficiency limit of silicon-based solar cells, which is (29%). Tandem cells made of two perovskite layers with ideal bandgaps have a theoretical efficiency limit of 45% and a practical limit of 35% – both of which are higher than the current practical efficiency limits for silicon. "You get more power for your money," said Stranks.